The store was clean and tidy. I had researched online what I wanted so it was a quick visit. The till area was a bit messy. Countertop was not big enough, there was some stock on top which I think was heading back to the shelves but it meant I didn't have space to place my purchases down. Also the question of would you like to donate the 1p change to charity I felt was forceful. I felt I had to say yes, I would rather you had a box on the counter so I had a better option of donation, plus I would know who it was going to and also if it was local. Very helpful gentleman served me polite and helpful thanked me for visiting the shop impressed at service I received. 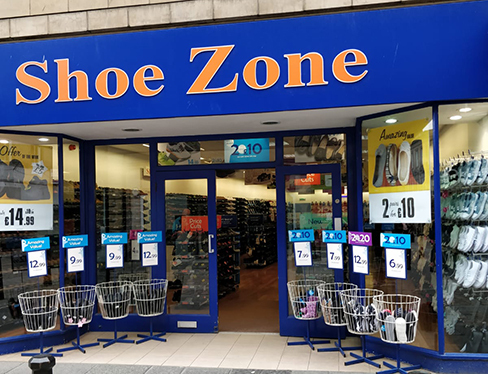 Sadly I was returning shoes I'd bought for my elderly aunt as they didn't suit, but - AS ALWAYS - the staff had been so very helpful and went out of their way to assist me with the initial purchase. They are, without question, the most pleasant and helpful staff in the entire city!! There seemed to be a sea of black foot ware on display, not many other colours in the boots or shoes available. Only one seat for me to use and the mirror on the edge of the row was too close to use probably. Although I got the exact type of shoes I was looking for and they were easy to find. I wasn't enticed to look further, sadly.